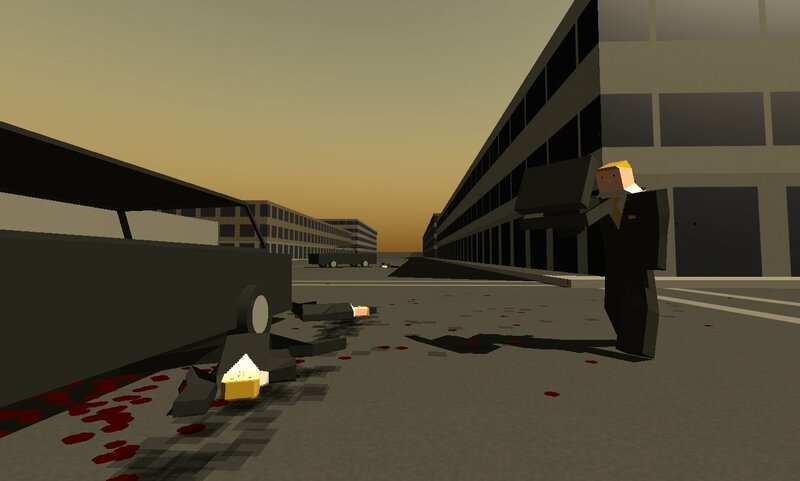 Sub Rosa is a multiplayer FPS made by Crytic Sea about tense deals, double-crosses and car chases. Set in an alternate laissez-faire 1980's city, you join one of three corporations with one goal: making money. Currently the game is unfinished. The game is inspired by videos of ShackTac's ArmA mission called Dark Business. With the only goal of which to make money, your team must either successfully trade with another group or steal anything the other groups have to make a profit. Having three teams in the game adds a nice twist to it. You and another team might deal with each and leave the other group out, that team might want to invade your private business deal; either way, anything can happen and you've always got to be prepared in order to keep your profits. The blocky graphics actually work with this kind of game; it keeps you less focused on the environment and more focused on the objective and those around you. The sound is not much to talk about, there are two types of sounds, one for guns, and one for cars, very simple and they mix in nicely with the graphics. The game itself is very poorly optimized, even though the graphics a very simple colors and everything has a blocky look to it you'll need a decent computer to play the game at a decent amount of frames-per-second. Lastly the only other problem with the game is not the game itself, but the community that plays the game. Ever since version 0.07 of Sub Rosa, the majority of those playing are people who don't know how to play the game and constant team-killers. Though you possibly might not encounter any of these people on some servers and you'll definitely have some fun with this game. (The ideas and opinions brought up in this review relate to version 0.07 of Sub Rosa, and may differentiate from later versions of the game).